Born in Reading, Simon began his career with Weymouth and graduated from their Youth Scheme. 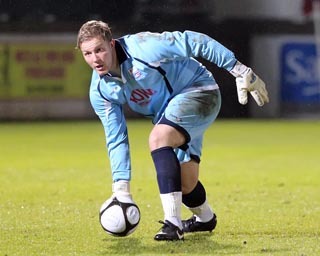 After a brief spell with Andover, he joined Dorchester Town at the start of the 2006/2007 season, making 46 appearances before leaving the Magpies in April 2008. After an injury layoff, he re-joined Weymouth in February 2009, shortly after the Diamonds 9-0 victory at the Wessex Stadium. He moved to Western League Division One side Bridport for the start of the 2009/2010 season, but made the switch back to Dorchester Town in early 2010. After a year with the Magpies, he was allowed to sign non-contract terms at Nene Park on 10 January 2011. After playing in the Hillier Cup game against Brackley Town on 12 January on non contract terms, his signed was completed on 17 January. He went on to make his Conference debut for the Diamonds on 9 April 2011 in the 2-2 draw with Wrexham at Nene Park following Joe Day’s transfer to Peterborough United. He was released in May 2011, and re-joined his former club Dorchester Town in early July 2011. After being an unused substitute on several occasions, he went on loan to Wessex Premier side Hamworthy United on 16 September 2011, and signed dual registration forms with them the following week. Simon left the Magpies at the end of the season and agreed a deal to return to Weymouth on 21 July 2012, extending his contract for a further year in June 2013. After a serious injury he moved to Dorchester Town as their reserve team manager at the end of 2015.